Mark Zuckerberg, a man who runs a service that collects the personal information of more than a billion people daily, seems to be worried about being spied on. There’s something very interesting in the photo Zuckerberg posted to celebrate Instagram’s 500 million monthly active users, can you see it? Look closer. 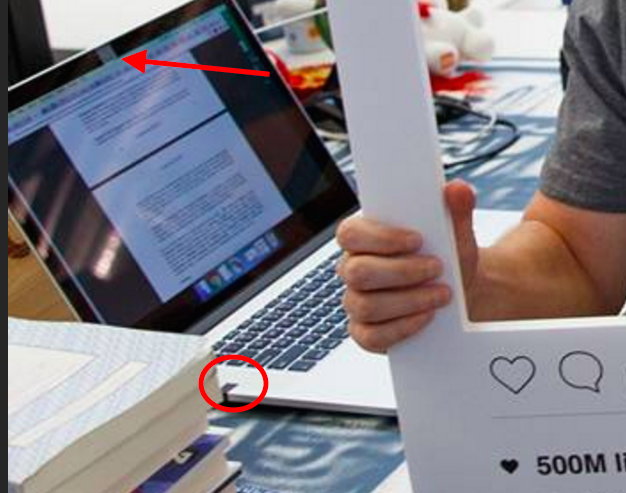 As Chris Olsen pointed out on Twitter, Zuckerberg’s camera and the audio jack on his Macbook are both covered with pieces of tape. Sophisticated hackers are able to secretly take control of a laptop camera, so Zuckerberg is beating any would-be hackers to the punch by rendering the webcam useless with a piece of tape. Of course, it’s not insane that one of the most powerful people in the world is paranoid about being watched — but Zuckerberg better hope the legions of users his company is depending on for live video content don’t take a lesson from his book. And yes, we’re pretty much sure that’s his desk. In a Facebook live video posted 9 months ago, Zuckerberg gave a tour of the exact desk he’s sitting at in the picture above, complete with the same books, wooden Facebook sign, and sun tan lotion.